Make it 5 or fewer. Flatten chicken to 1/4-in. thickness. In a shallow bowl, combine bread crumbs and 1 teaspoon of mustard. In another shallow bowl, combine honey and remaining mustard. 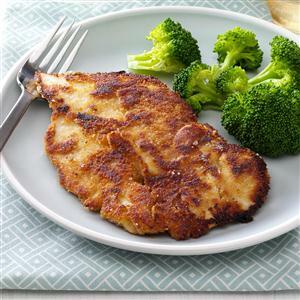 Dip chicken in honey-mustard mixture, then coat with crumbs. In a nonstick skillet, cook chicken over medium heat in butter for 4-6 minutes on each side or until chicken juices run clear. Yield: 4 servings.